From the two-time Pulitzer Prize winner comes this surprising portrait of Wendell Willkie, the businessman–turned–presidential candidate who (almost) saved America’s dysfunctional political system. In the wake of one of the most tumultuous Republican conventions ever, the party of Lincoln nominated in 1940 a prominent businessman and former Democrat who could have saved America’s sclerotic political system. 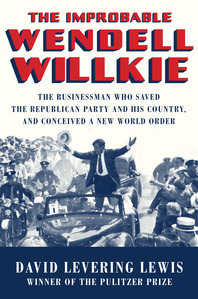 Although Wendell Lewis Willkie would lose to FDR, acclaimed biographer David Levering Lewis demonstrates that the corporate chairman–turned–presidential candidate must be regarded as one of the most exciting, intellectually able, and authentically transformational figures to stride the twentieth-century American political landscape. Born in Elwood, Indiana, in 1892, Willkie was certainly one of the most unexpected, if not unlikely, candidates for the presidency, only somewhat less unlikely than Barack Hussein Obama. Although previously marginalized by journalists like Theodore H. White and David Halberstam as a political invention of rich newspaper publishers, the Willkie who emerges here is a man governed by principles who seldom allowed rigid categories to stand in his way. Even as a young man, he quickly distinguished himself as a reform-minded lawyer, whose farm-boy haircut, hayseed manners, and sartorial indifference bespoke common-man straightforwardness but concealed an ambition that propelled him at forty to chairman of Commonwealth and Southern, the country’s third-largest private utility holding company. It was Willkie’s vehement opposition to government regulation of the free-market economy and his success in wrenching a fabulous monetary settlement from the Tennessee Valley Authority that attracted the attention of Republican leaders, who, like Willkie, felt that FDR was turning the office into an imperial presidency. Successful at outwitting the isolationist wing of his own party, Willkie took on Roosevelt during one of the nation’s darkest periods, creating an unlikely alliance of supporters, including anti-big-government business leaders and black voters, who rightly felt excluded from New Deal benefits. Despite receiving the largest percentage of Republican votes in a generation, Willkie lost but, in the process, proposed sweeping civil rights reform a full generation before the civil rights era and a progressive “new conception of the world” that remains inspirational at a time when our own national belief system has become alarmingly immoral and rudderless. Rather than continue a political battle that could have weakened the nation during its darkest hour, a defeated Willkie reconciled with the president and embraced the war effort, while writing One World, a visionary credo that hoped to instigate an international movement for the betterment of the world’s people. In rejecting America’s penchant for exceptionalism, Willkie championed this internationalism more passionately than any American politician before him, creating a sovereign philosophy of liberalism that balanced free enterprise with social responsibility. His untimely death at fifty-two in 1944 left this prophetic vision tragically stillborn.